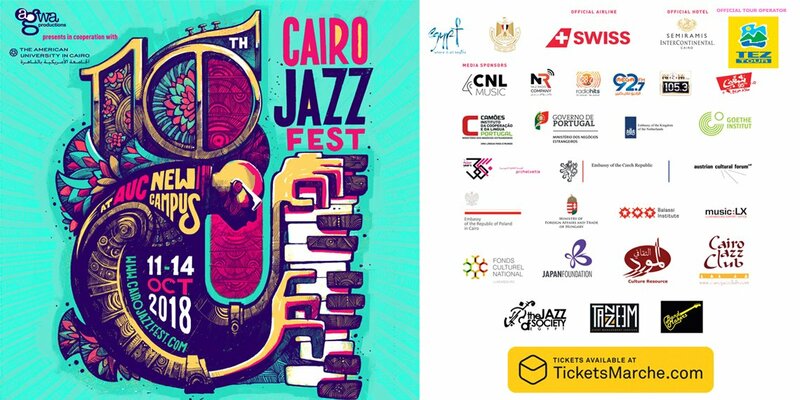 Cairo International Jazz Festival (CJF) celebrates its 10th anniversary this year in an extra-ordinarily 4-day course festival from 11-14 October 2018 gathering a line-up of 20 bands from 14 countries. The festival is BIG this year, and even BIGGER with various activities happening around it, including workshops, a huge photo gallery showing the history of CJF over 10 years, Jam sessions, Kids music program, Panel discussions, talent shows and LOTS of club gigs! CJF this year will be taking place at AUC New Campus in Tagamo3 in different venues and auditoriums inside the AUC. The aim of this event is to create a multi-day event for everyone to enjoy music, jazz, culture and socialize in a fun atmosphere and encourage Egyptian musicians to produce more Jazz and present their works internationally. CJF will present this year a special 10th edition line-up of the best of International and national Jazz, with Top European singers such as Dan Barta, Rita Maria, Eszter Vaczi and World famous Pianists such as; David Helbock, Aki Rissanen and Filipe Raposo. On the other hand, Egypt’s finest Jazz Line-up such as Hisham Kharma and Cairo Steps taking place on stage to present their best of Jazz.